It isn’t the billions of ideas, that pop up in the minds of humans around the globe that make money. Very few ideas are worth the time it took for the thought. Most ideas are fleeting “sparks” that go no place and are forgotten before the next day. 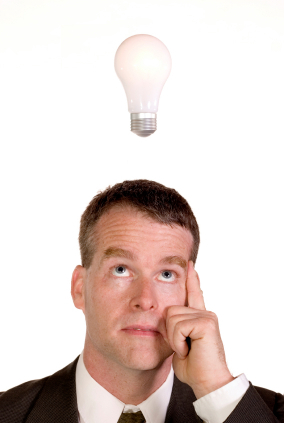 Of the ideas that are good, very few are followed up and ever end up as a worthwhile development in the market place. Most people are just not oriented to do anything about their ideas, while others believe it would take too much of their time and money to follow through to completion. This leaves the market place wide open for the person who learns how to “create” profitable and money-making ideas! Find something that already exists, the presence of which has never been known before. Invent something. Most inventions are merely new arrangements of things that have already been invented..
Alter or improve in any number of different ways something that already exists. As you “create” ideas, write them down. What you dream up can be your key to great wealth. Keep your mind “open” as you go through each day. What did you notice in the department store that would reduce costs, save money or increase sales if some simple procedure were added or something changed? Ideas for improvements are one of the most valuable things you can contribute to society and at the same time add to your bank account. To create ideas for improvements, consider every possibility and alternative for the thing you want to improve. Learn to create money-making ideas by evaluating all the different aspects of the product, method or concept you are interested in. Put your imagination and subconscious to work and write down your thoughts pertaining to each of the things you expect to improve. Use the following as your guide for creating money-making improvements. Do you have the know-how to do the work required to improve it? Could it be combined with something else to make it more practical? Should the appearance be changed… streamlined? to improve quality and increase profits! The above money-making idea format will start the ideas “sparking” and as related ideas come to mind write them down in every variation you can think of. Do not judge the good or bad points of the ideas as they materialize to you, just write them down and judge them afterwards. You will stop the flow of ideas if you are critical of your thoughts before you put them on paper. When you have answered everything you can about the product or concept and know how it fits in with your plans, sit down and evaluate all the details you have written. After you have found (created) a good idea, follow it up with questions on what should be your next move in order to do something about it, then act! Get it moving. Expose it to the world with sufficient tests to determine the value! Come up with ideas that are still in the processing stage rather than get stuck on several vague points that may be worked out later as your subconscious goes to work. If your idea fails, so what; you are just that much closer to finalizing another one, then another… until a useful more valuable idea is born. Every manufacturing plant, retailer, attorney, accountant; every business person, large or small, cannot continue to operate in the competitive world of today without someone in the organization constantly coming up with new and better ideas! Old ideas drop by the wayside as new ideas take their place. Old companies without new ideas fade away. Those who learn and know how to create ideas and anticipate the changes needed, as the future evolves, have the opportunity to be a great success with big money-making potential! Another “tool” you can use to help dream up that million idea, is to spend several minutes each evening, relaxed with your eyes closed. Pick any object that comes to mind and try to change it in your “mind’s eye”. Change it in every manner you can think of to improve it. The following evening pick another subject or object and repeat the process. Soon you will be using 20% of your brain power instead of the 10% normally used by the average person. As your knowledge and “brain power” increase so will your bank account. When you have come up with a good idea, write a full description of it and make a sketch if necessary. Place the written information, the sketch and any other pertinent facts or documents in an envelope addressed to yourself. Have the post office seal the envelope with a date stamp over the flap, then send it to yourself by registered mail. Keep the envelope, unopened, in the event you need to prove ownership. Of course if your product has a properly registered trade mark, has been copyrighted, or you have a U.S. patent you are protected from infringement. A Few Idea “Sparks” !! When you come up with an idea, program or product that is so superior in style or performance that it is unbelievable you may need a notarized statement to assure your customer you are offering an honest deal. Make a habit of examining each piece of correspondence you receive, taking care of it right at the time, do what is necessary right then. Never put it aside to be handled a second time if it all practical. This can save more time than anything else for an executive who handles a large amount of correspondence and mail. You can also save many more hours each week by doing several of the most important things that need to be done each day before you take up other, time consuming important details. Another good way to “spark” ideas is to go through the classified and want ads in the newspaper … Also the yellow pages of your telephone directory. As you read, think of something that would be of value to the company or person, or enhance the item you are reading about. In summary, learn to develop ideas from observing everyday things and details. Think of what could make something better. Dwell on things that have a large marketing audience, something that everyone needs and wants. Write your ideas down. Put a pencil and pad at your night stand. When you remember a good dream… don’t just lay there, by morning you will forget it… Jot it down on the pad. You will be surprised what you can dream up! Maybe the million dollar idea will magically appear on your pad tomorrow morning!